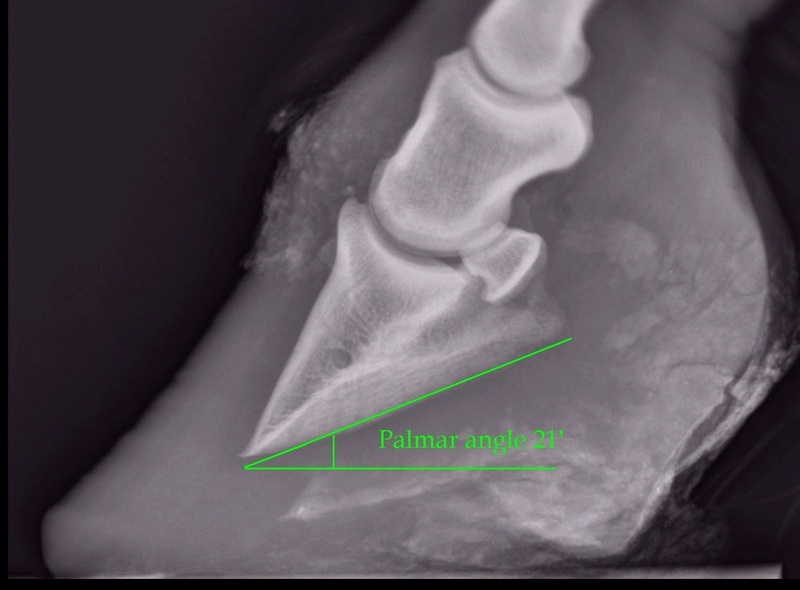 X-rays (correctly called radiographs) are essential for assessing changes in the feet following laminitis, and should clearly show the relationship between the hoof capsule and the internal structures of the foot to help the hoofcare professional. Correctly marked and positioned x-rays can be used to assess the severity of changes/damage, reach a prognosis, guide the realigning trim/rehabilitation and monitor response to therapy. 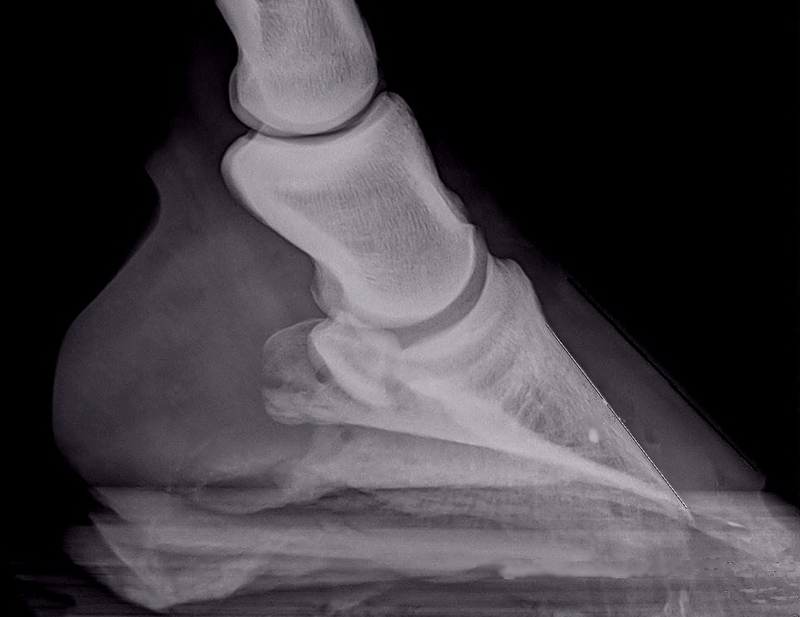 "The goal is to acquire an image that precisely defines the position of the hoof capsule and its relationship to the bone and to the ground" - Debra Taylor, p 234 Care and Rehabilitation of the Equine Foot. 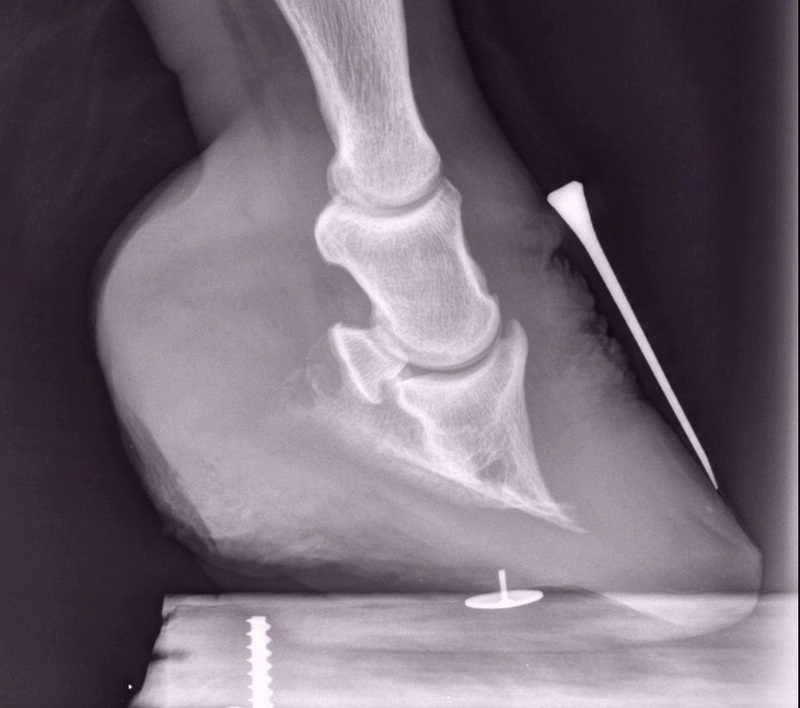 The horse should stand with both feet (fronts or backs) on equal height non-slip blocks that are 1 cm lower than the primary beam of the radiograph machine, with a radiopaque marker inlaid in the centre of the top of the blocks to show the groundline and help calculate the palmar angle and sole depth. If only one block is available the other leg in the pair should usually be held up to ensure weight bearing when the x-ray is taken, but using two blocks is better. X-rays should be taken in a clean, flat area with an electricity supply. The feet should be thoroughly cleaned. 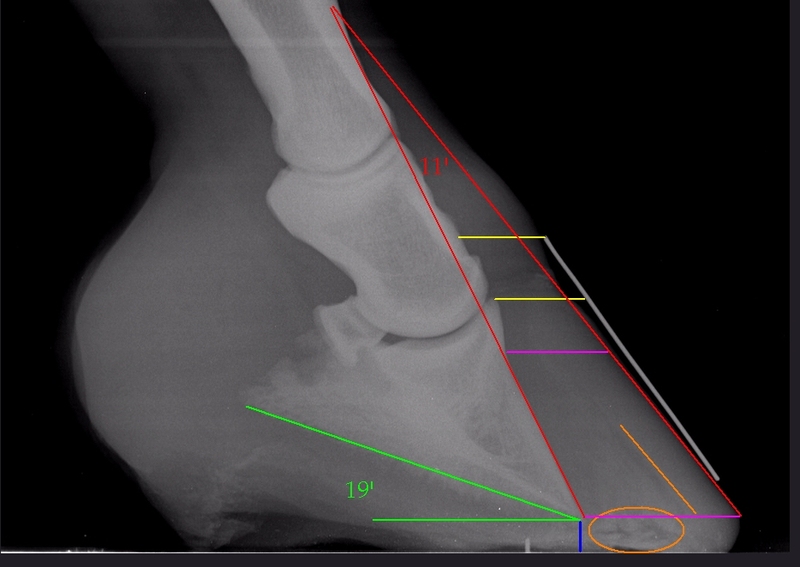 The foot should be positioned parallel to the sides of the block to achieve a true lateral image, with the medial (inside) of the foot touching the x-ray cassette - this prevents magnification errors. 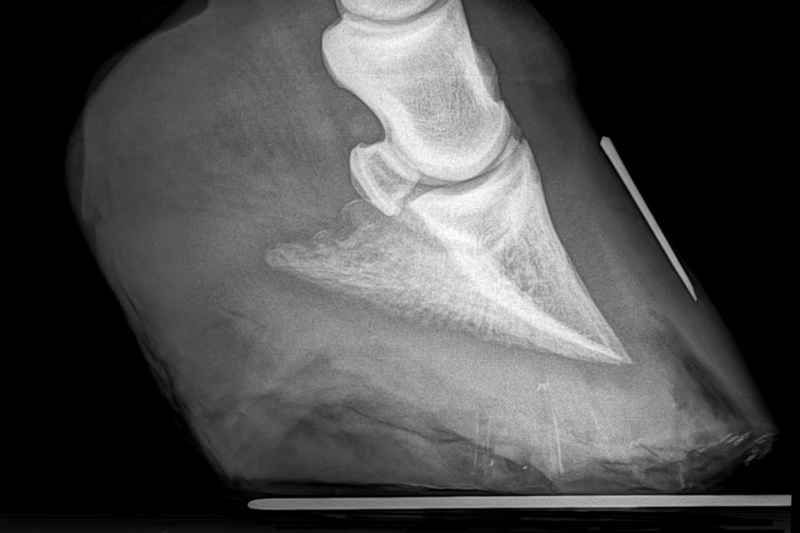 The radiograph machine should be positioned on the floor with the primary beam exactly midway between the toe and the heels, 1-2 cm above the hoof block/at least 2 cm below the coronary band, and parallel to the block/hoof. 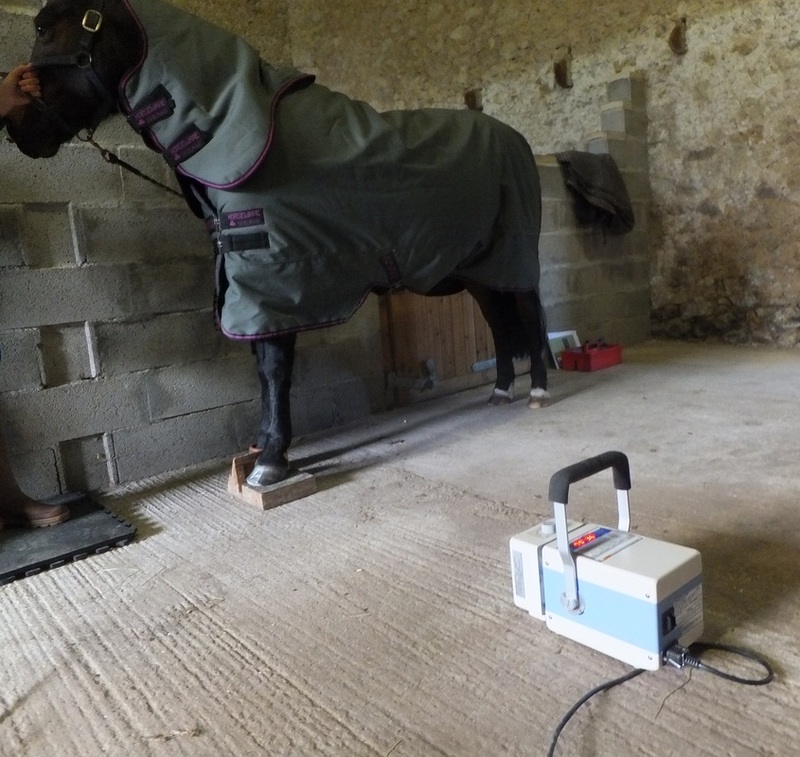 The hoof wall should be marked to indicate the hairline at the toe with something metal/radiopaque - barium paste is ideal as this follows the contours of the hoof and can mark the point of breakover, but metal wire or even a clench can be taped into position. This is essential - many vets using digital equipment feel this is no longer necessary. It is. 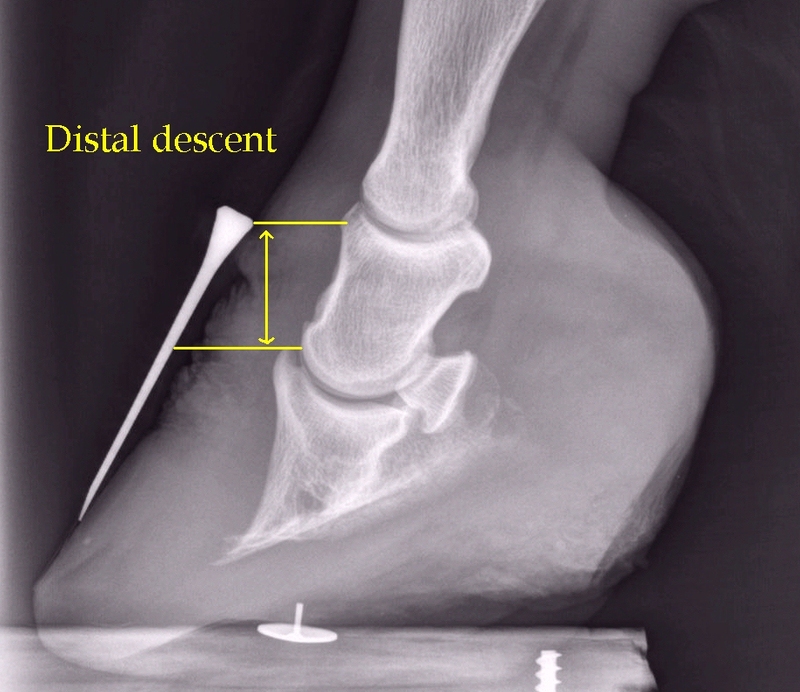 Without this marker it can be difficult to estimate distal descent and hoof:laminar width. 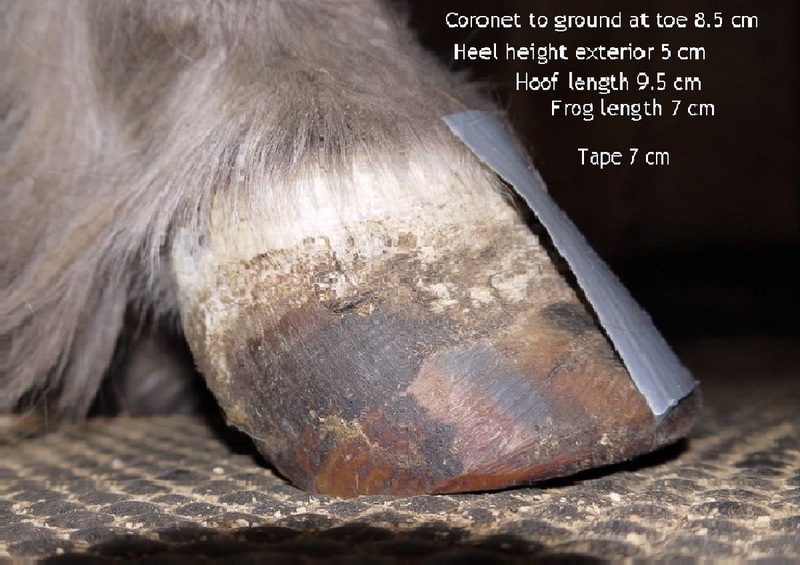 Hairline/hoof wall marked at the toe with a clench taped on with duct tape - see x-ray right. Marking the hairline clearly enables distal descent to be measured. 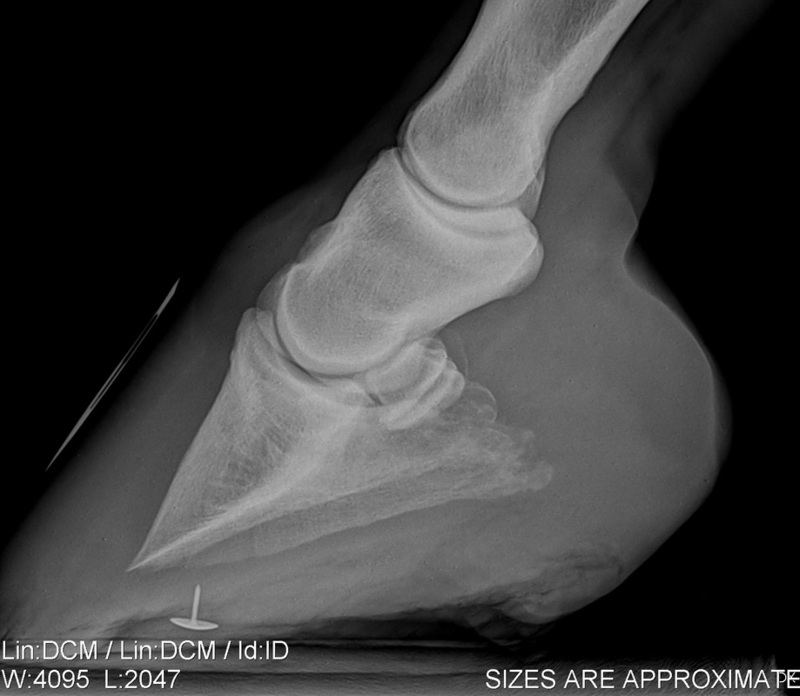 This pony had long-term chronic laminitis with heels kept high despite regular trims. This has resulted in significant distal descent and some bone loss at the tip of P3. The true frog apex (found by gently trimming the frog to reveal the seam between sole and frog) can be marked with barium or with a sawn-off drawing pin. It can be useful to mark the position of the sawn-off drawing pin on the sole before removing it, and to take a photo showing the position. If a drawing pin is used to mark the frog apex, it MUST be sawn off - this horse had reasonable sole depth, but note how close the tip of the drawing pin appears to be to P3 and the solar corium. If possible, always take photographs of the foot in position at the time of the x-ray, showing the markers in place - for correct interpretation of the x-rays questions will be asked such as was the medial quarter of the hoof touching the cassette (if not, hoof wall thickness cannot be measured), was the horse equally weight bearing and were the cannon bones vertical (if not, bony column rotation cannot be measured) - much easier to rely on photographic evidence than memory! Marking the apex of the frog provides an important reference for trimming, and helps to determine whether the apex of the frog is “true” or has grown forwards. This research suggests that the "normal" bony column (P1, P2, P3) is not straight. No groundline and x-ray beam not perpendicular to the foot. Very difficult to measure palmar angle and sole depth. No hairline/toe wall marker making it very difficult to measure distal descent and dorsal angle. Clear groundline making it easy to assess palmar angle and sole depth. Hairline/toe wall marker enables distal descent and the dorsal angle to be measured. Artifact - a positioning artifact is the appearance of a structure on the x-ray that doesn't really exist in the part of the body x-rayed, and is usually caused by an incorrect relationship between the x-ray machine, the cassette or the horse.